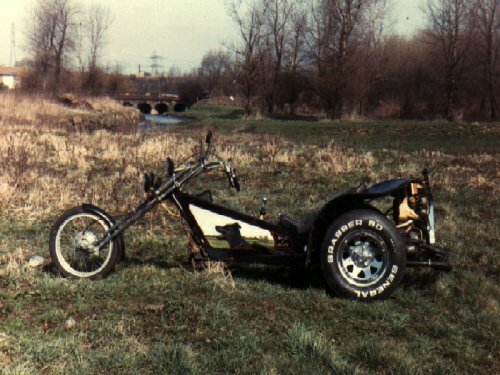 My first ever trike. What a learning curve that was. I started building it in "Ratface's" garage, then moved to Rod Biddle's garage. Those springer forks didn't last long, I fitted the front end from a CX 500 and altered the rake angle. It also saw a great deal of red powder coating too. The trike managed to snap a drive shaft whilst going up Countisbury Hill - I ended up being towed back to Porlock behind Andy's Yamaha RD 250. The village blacksmith fixed the drive shaft for the grand sum of four pounds. 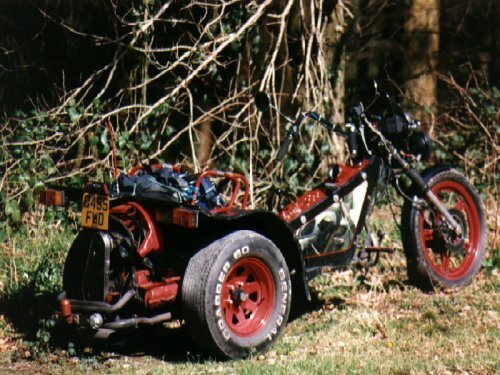 The paintwork on the side panels was done by Pete Cain, although the trike was sold I still have the side panels . 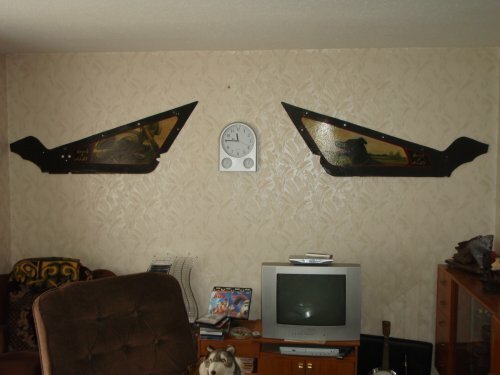 . . in fact they are on the wall in my front room. I sold the trike to "Big Sid" from the Moonshiners, and as far as I know it's still unused in his garage, though I did hear it was up for sale.